INSPIRED MASTER BEDROOM - Decor Designs, Inc. Nothing feels better than retreating to a Master Bedroom sanctuary at the end of a long day. “Sanctuary”, of course, is the key word in that sentence. Unfortunately, a lot of Master Bedrooms I come across look like they are the lowest priority on the list and everything but a sanctuary! 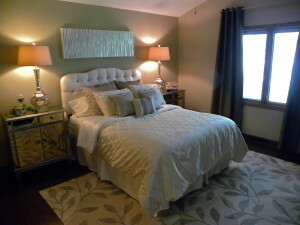 One of this week’s projects included putting some masterful touches on this Crystal Lake bedroom sanctuary. The Owners met with me a couple months ago to look over the space and plan the project. To clean up and update our “canvas”, we needed to remove and replace the dated parquet flooring, remove the popcorn ceiling, and paint the walls. Over the next month or so the Owners were able to complete their homework and ready the space for new furniture, art, accessories and window panels. 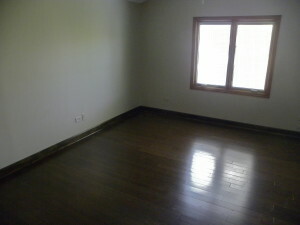 Our inspiration room (seen above)was one that the homeowner found online. 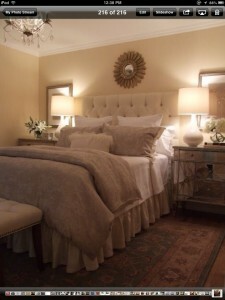 She loved the upholstered headboard, mirrored chest, large lamps and monochromatic color palette. After a few weeks shopping and ordering the necessary components, this week we styled the room with our new additions. As I’ve said before, “Imitation is the sincerest form of flattery”! If you need to redo spaces in your own home but don’t have the “eye” or can’t afford to hire help, take advantage of resources like Pinterest.com or Houzz.com to get inspiration and copycat away! Don’t settle for anything less than your own masterful bedroom retreat. Happy Decorating from Decor Designs! This entry was posted in Decorating Tips, Interior Decorating and tagged Interior Decorating on June 27, 2014 by Jeff Rice.